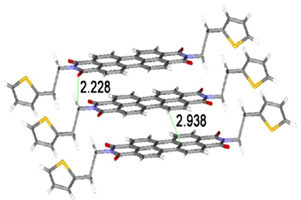 Highly fluorescent heterocyclic ring bearing new perylene diimides were synthesized and their photo-physical properties were studied. Both compounds self-assembled as suprastructures through interfacial p-p stacking and non-covalent forces. Scanning electron microscopic images suggest that the change in side chain largely affects geometry of self-assembled structures. Observed self-assembled supramolecular structures were strongly supported by the computational study results. The new compounds are with moderate band gap and suitable for optoelectronic applications.